Plato, seeking a worthy use for the money that was the price of his redemption, then bought with it a small park a mile outside the western walls [of Athens], close to the shrine of a local hero Akademos. This was the Academy where for the rest of his life he lived austerely with a group of friends and pupils, devoted to study and contemplation. ... Plato's Academy lasted for 900 years, until the Christian emperor Justinian suppressed pagan philosophical schools (A.D.529). Sorabji's account is rich in detail and interpretation of texts, but the outline of his narrative is strikingly clear. Plato's central innovation in philosophical psychology, on Sorabji's reading, is to go beyond the traditional distinction between soul and body by maintaining that the soul itself has parts which sometimes conflict. Within this vision of the complex soul, Plato seeks to emphasize the importance of reason at the expense of sensation or perception. His magnification of the role of reason might seem to increase the gap between humans and other animals, but Plato's frequent reference to the migration of souls across species lines reduces the psychic space between man and beast. Aristotle famously claims in the Politics that humans are the only animal capable of logos (though he elsewhere attributes forms of reason and intelligence to animals, for example in the first chapter of the Metaphysics), but his psychological theory as a whole is marked by a narrowing of the scope of reason relative to Plato, and a corresponding increase in the cognitive content of the power of perception (aisthesis), a capacity possessed by all animals. PLATO: (428-347 B.C.) profound Philosopher, Transcendent Genius, Interpreter of his great teacher Socrates. In the 2nd book of the "Republic" Socrates develops his idea of the diet best adapted to the general community. "The work-people will live , I suppose, on barley and wheat, baking cakes of the meal and kneading loaves of the flour. And spreading these excellent cakes and loaves upon mats of straw or upon clean leaves, and themselves reclining upon rude beds of yew or myrtle boughs, they will make merry, themselves and their children, drinking their wine, weaving garlands, and singing the praises of the gods, enjoying one another's society and not begetting children beyond their means through a prudent fear of poverty or war ... We shall also set before them a dessert, I imagine, of figs. peas and beans; they may roast myrtle berries and beech nuts at the fire, taking wine with their fruit in great moderation. And thus passing their days in tranquility and sound health, they will, in all probability, live to a very advanced age and, dying. bequeath to their children a life in which their own will be reproduced." Then Socrates proceeds to point out how the new ideal Republic will become plunged into injustice and violence and fall into decay just as soon as it oversteps the limits of necessaries and makes the flesh diet and the acquisition of wealth objects of supreme endeavour. "By this extension of our inquiry we shall perhaps discover how it is that injustice takes root in our cities.. .If you also contemplate a city that is suffering from inflammation (whose people have departed from simplicity), they will not be satisfied, it seems, with the mode of life we have described, but must have in addition, couches and tables and every other showy article of furniture, as well as meats and viands. We shall need swine-herds (for such a city) ... and great quantities of all kinds of cattle for those who may wish to eat them ... Then decline and decay." ... All this is told in an inimitable Dialogue between Socrates and Glaucon, which only lack of space prohibits reproducing in full [see pp. 50-51 below]. Ovid remarks that "Plato, doubtless, reached his great age, becausc of his moral purity, temperance, and natural food diet : of herbs, berries, nuts, grains, and the wild plants of the mountains, which the earth, that best of mothers produces." 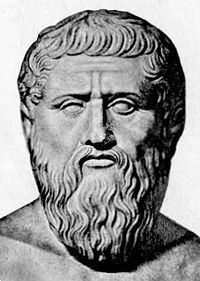 The Republic of Plato (link to archive.org) trans. Thomas Taylor c.1800. This edition: London, c.1894. In Books II & III Plato (428-347 BC) develops the dietary ideas of Pythagoras. Plato's Republic (link to archive.org) commentary by Lewis Campbell M.A., Ll.D., London, 1902.